Acclaimed Garifuna performer, Aurelio Martinez will be performing at the Bliss this weekend as part of his The Laru Beya World Tour. I was privileged to see Aurelio in Dangriga, Belize at the Blissfulsage Foundation benefit concert on May 14, 2011. And I can tell you that I was definitely pleased with his performance. 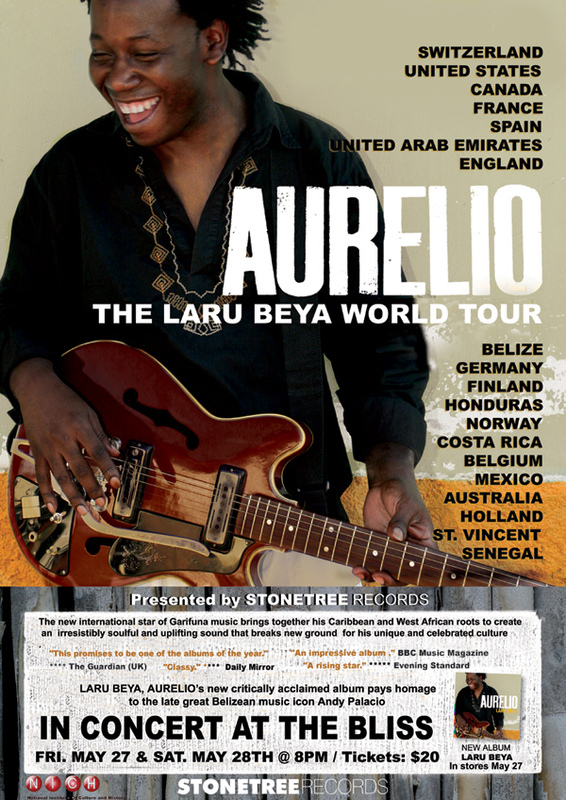 But Aurelio needs no introduction to those familiar with Paranda and traditional Garifuna rhythms . The dreadlocked singer and his group of multi-talented Garifuna Soul reached as far as Senegal and will definitely entertain you with their very own harmonious body movements and dancing. This is one of the most anticipated concert in Belize this Summer.....don't miss it!!! Here's a sample of Aurelio performing in Dangriga recently.